For digital downloads please scroll down to the window at the bottom of this page. As a recording artist, Erick children's CDs have received rave reviews and feedback from kids and parents alike. This page includes a few free MP3 samples and lyrics for all of his CDs. Erick is now a published children's author and he has also released a CD of some of the songs he does at the pubs. 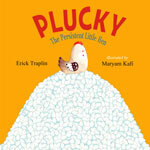 Erick & Maryam Kaffi have released their latest book "Plucky, The Persistent Little Hen"
Maryam has wonderfully illustrated Erick's "Chicken Song" It's a fun look at setting goals and not giving up when success doesn't happen right away. Erick has partnered with sign language instructor Leslie Lang from Little Hands Talking and illustrator Maryam Kafi to produce this wonderfully illustrated book & cd on signing for hearing children to enhance home learning and practice of sign language. A delightful story about a brave little mouse who meets up with Santa Claus on Christma Eve. 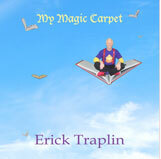 Erick has released his latest cd "My Magic Carpet " Featuring "My Magic Carpet" an ode to books "You Can't Catch Me" and "Hip Hop Little Rabbit" 2 great little action songs and many more. Erick now has 3 children's books published!